Is medium-length, wiry, and straight. The Undercoat is abundant and thick. Colors can be dirty white mixed with chestnut, white or steel gray with chestnut markings, gray, chestnut, or roan. Wirehaired Pointing Griffons are obedient, intelligent, eager to please and easy to train. Wirehaired Pointing Griffons are obedient, intelligent, eager to please and easy to train. 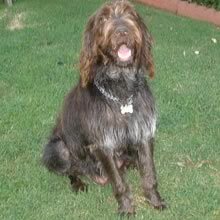 Wirehaired Pointing Griffons are obedient, respectful with strangers, good with other dogs, but like to chase cats. They are particularly good with older, respectful children. You can find Wirehaired Pointing Griffon puppies priced from $850 USD to $1500 USD with one of our credible breeders. Browse through our breeder's listings and find your perfect puppy at the perfect price. Wirehaired Pointing Griffons are obedient, respectful with strangers, good with other dogs, but like to chase cats. They are particularly good with older, respectful children. Weekly brushing and combing to remove dead hairs is very important. The intelligent and eager-to-please nature of this breed make training a relatively simple process. This dog was originally bred for hunting. Consequently it needs a lot of exercise. It is not suitable for city or apartment life or any situation where it will not have room to run freely. Wirehaired Pointing Griffon Puppies for Sale - Shipped Worldwide! Finding the right Wirehaired Pointing Griffon puppy can be dog gone hard work. PuppyFind® provides a convenient and efficient means of selecting and purchasing the perfect Wirehaired Pointing Griffon puppy (or Wirehaired Pointing Griffon puppies) from the comfort of your home, 24 hours a day, 7 days a week. Take advantage of our PuppySearch or leisurely browse our directory of hundreds of dog breeds, Wirehaired Pointing Griffon dog breeders, Wirehaired Pointing Griffon dogs for adoption, and Wirehaired Pointing Griffon puppy for sale listings with photos and detailed descriptions. Some Wirehaired Pointing Griffon puppies for sale may be shipped Worldwide and include crate and veterinarian checkup. Many Wirehaired Pointing Griffon dog breeders with puppies for sale also offer a health guarantee. With thousands of Wirehaired Pointing Griffon puppies for sale and hundreds of Wirehaired Pointing Griffon dog breeders, you're sure to find the perfect Wirehaired Pointing Griffon puppy.